The District of Rhein-Hunsrück is located on 963 km2 in the State of Rhineland-Palatinate in southwestern Germany. Home to approximately 103,000 citizens, the District has set a goal of converting the 290 million euros it spends on importing energy into added community value. It aims to achieve this goal by entirely switching its energy system to one based on efficiency and local, renewable sources by 2020. By 2010, 65% of Rhein-Hunsrück’s electricity was being generated by renewable energies – photovoltaics, wind, and biomass, with a pilot hydropower in progress. By 2012, the District had become a renewable electricity exporter and expects to increase the surplus of renewable power over the coming decades. 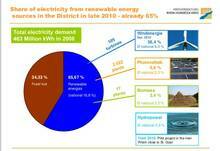 The District targets meeting 236% of the District’s power consumption with renewables by 2014, 507% by 2020, and 828% by 2050. Besides exporting, the surplus can be used for efficient electric heat pumps that supply carbon-free heating, for methane created from excess wind and solar electricity, and for charging electric battery and fuel cell powered vehicles. 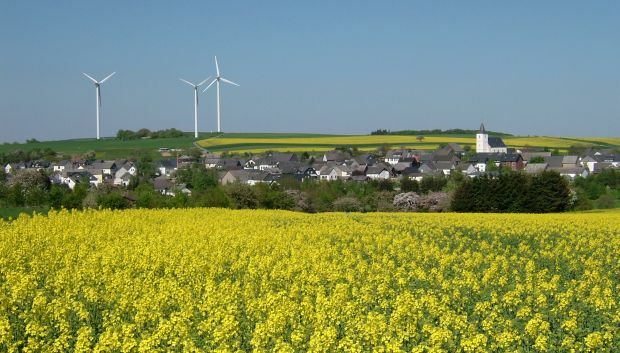 Looking back on the early stages of Rhein-Hunsrück’s clean energy shift, from 1999-2009, the District focused on building efficiency improvements. This effort led to a 25% reduction in heating demand, a 5% reduction in electricity demand, and 26% reduction in water demand. CO2 emissions were reduced by 5400 metric tons. Cost savings reached 1.13 million euros. To lower local building energy requirements, the District implemented a number of measures, including passive solar principles and brine heat pumps connected to ground heat collectors. Technologies that make use of abundant local renewable resources – for example, wood pellet heating, biomass-based district heating, and rooftop PV – also have dramatically lowered carbon emissions and imported fuel costs. By 2009, 93 full time jobs related to renewable energy installation had been created, 269,000 tons of CO2 emissions had been avoided through use of renewable electricity, heat and biofuels, and 12.3 million euros had been saved by avoided import costs for coal, natural gas and mineral oil. 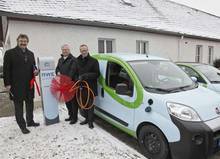 In 2010, Rhein-Hunsrück saw its first zero-emissions school. The process began in 2006 with the connection of the school to the local district heating grid, which is fueled with wood chips and a combined heat and power (CHP) unit that utilizes oil from regional rapeseed. In 2008, the swimming pool pump was upgraded to a high efficiency model that saves 10,000 kWh per year. In 2007 and 2010, a sum total of 93 kW of PV were installed that produce 86,500 kWh annually, that is, 33% more power than the facility consumes. These improvements have led to 14.5 tons a year of carbon credits. A similar achievement was made at the Herzog-Johann Gymnasium (High School) sports center, which gained zero emissions status in 2011. Rhein-Hunsrück has invested a total of 7.5 million euros in district heating networks that provide heat to public buildings, such as those in the towns of Simmern, Kirchberg, and Emmelshausen. Currently, they are fuelled by local tree and bush cuttings, although plans are in the works for anaerobic digesters that will also produce biogas out of liquid biomass. The existing systems feed 10 million m³ of biogas into the natural gas grid each year as of Fall 2012 and save the District the equivalent of 660,500 liters of fossil fuel oil a year. Over the course of the twenty years from approximately 2011-2031, the investment is expected to bring the added value of ensuring that at least 10.5 million euros in fuel delivery costs stay within the region. 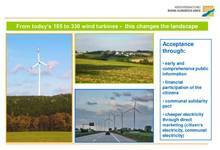 By 2050, the aim is to have annual energy delivery cost savings mount to 250 million euros. 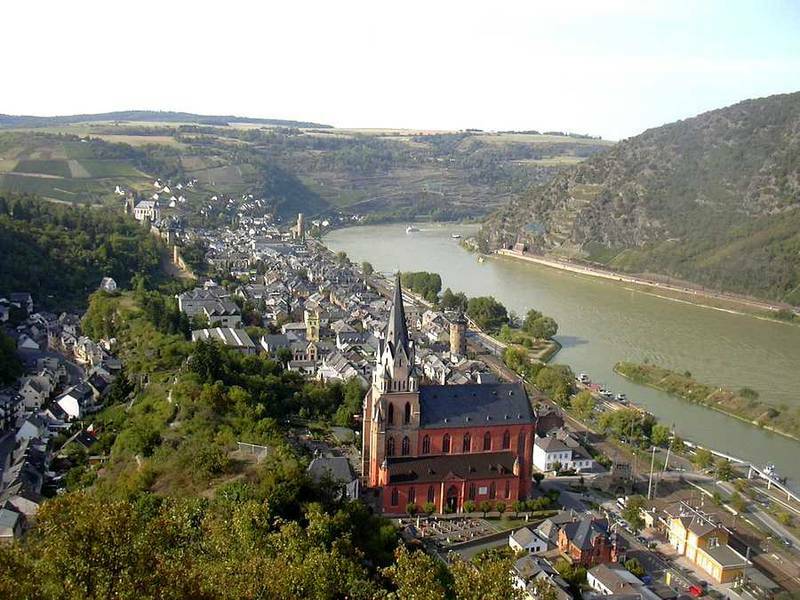 The District of Rhein-Hunsrück also aims to maximize the energy and profit producing potential of rooftop PV. 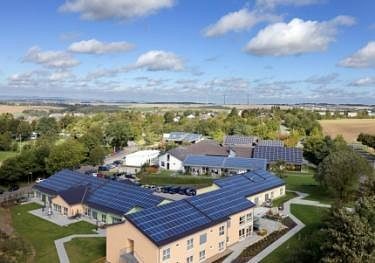 Germany’s Feed-In Tariff law (Renewable Sources Act) and simple permitting processes have helped ensure that rooftop solar is a relatively easy and sound investment. According to the District’s online solar roof mapping project, 58,600 of 80,000 roofs in the District are suitable for solar PV. Of this, 7% of the potential had been used as of 2011. To show its commitment to advancing rooftop solar, the District is installing PV on public administration buildings. From 2007-2011, total capacity on public buildings jumped ten-fold from 35 kW to 366 kW. The District has created several measures to help ensure that the community buys in to the energy transition, that young people learn early about it, and that it gets implemented well. For example, there are extracurricular educational facilities where kids can learn about renewable energy and ecological stewardship. Additionally, a public relations campaign focuses on early and comprehensive public information, with special marketing attention given to opportunities for citizen financial participation in the energy transition, communal solidarity, and electricity cost savings. 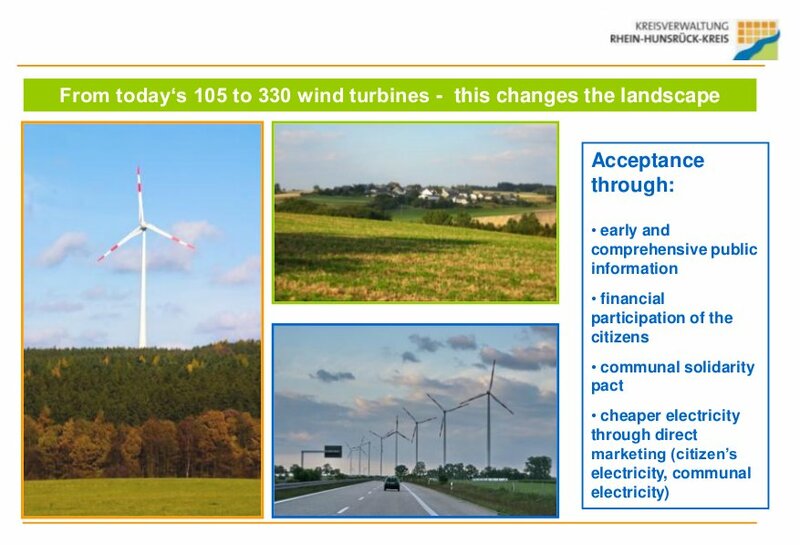 Rhein-Hunsrück has also been working with the Institute for applied Material Flow Management (IFaS) on establishing an inventory for energy consumption and polluting emissions, as well as an outlook for improving this balance sheet for 2020 and 2050. IFaS has also been assisting with determining efficiency and renewable energy potentials, conducting a series of 9 workshops, and setting up a list of 92 measures to help the District achieve its energy goals. A Climate Protection Manager was appointed to oversee implementation of these specific measures from 2012-2015.